Herbs contain natural plant drugs which stimulates healing reactions throughout the body. Most people will be unaware that herbs are the foundation of modern medicine. This is the result of decades of scientific research into the active ingredients of plant remedies. A large range of potent drugs have been produced from plant origin, for instance - asprin came from willow bark, digoxin for heart failure came from foxglove. Some steroids came from wild yam and anti-leukemia drugs from madagascan periwinkle. Some 70% of the drugs in the British Pharmacopoeia are derived from plant origins. Herbs of course can have profound effects in the body and must be used with care. They should be cross checked to verify they will not react with another medication being concurrently taken, whether another herb or pharmaceutical drug. Many herbs are synergistic in nature and can magnify responses, which may be beneficial in many cases, but could also cause an unwanted side effect. A phytopharmacist or medical herbalist is trained to recognise herbal combination in a formulated preparation or decoction. 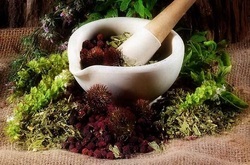 These herbal medications are usually prepared on the basis of the individual's needs and special circumstances.